This is the first edition for new PULSE editor Alissa Craft, DO, MBA. A graduate of the Kirksville College of Osteopathic Medicine, Dr. Craft completed her pediatric residency at Phoenix Children’s Hospital and fellowship training in Neonatology at the University of California, San Diego. I want to thank Alissa Craft, DO, MBA, FACOP for assuming the editorship of our PULSE. This newsletter is an important forum where our members learn about events within our college. I look forward to her leadership in continuing to develop the content and the format of our PULSE in the future. It was many years ago and DOs were just starting to be accepted into a few MD courses – very few. I spied a course on Pediatric Neurology given at Mayo Clinic and I decided to risk applying; I was accepted. Then I learned that Harold Finkel, DO, and Mike Richardson, DO, (both now gone) had taken the same risk as I, and we went together. 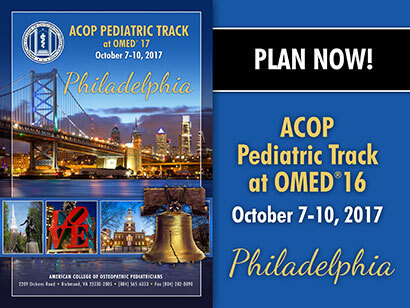 The ACOP CME Committee has created a CME program to meet your educational needs to address timely topics and updates in neonatology and pediatrics. ACOP is pleased to announce the following new members who will add strength, expertise and vitality to our college. ACOP welcomes news of our members' contributions to journals and other scholarly publications. Please contact the PULSE Editor to share your accomplishments with your fellow members. 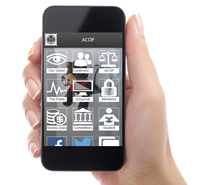 ACOP welcomes news of our members' news worthy information. Please contact the PULSE Editor to share your accomplishments with your fellow members.